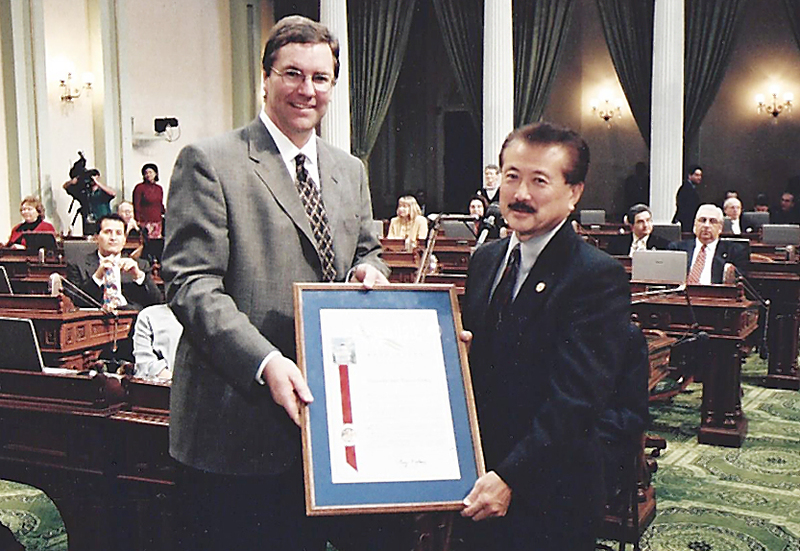 Assemblymember George Nakano presents a commendation to former State Sen. Ralph Dills in 2001. The two people who come to mind that stood up against all odds in 1942 and put their political careers in jeopardy are Ralph Dills and John Shelley. Very little is known about what they did because they were never publicly recognized by the Japanese American community. It is shameful that they were never honored for their heroic deeds. In 1942, when the California State Legislature had a resolution in support of Executive Order 9066, then State Sen. John Shelley and Assemblymember Ralph Dills voted against the resolution. They were the only two to do so. Dills was threatened with expulsion from the State Assembly, but he knew the order was unjust and always remembered the generosity and kindness that were extended to him by Joe Kobata, owner of a nursery in Gardena. Kobata loaned Dills money so that he could attend college and provided him with a part-time job during the spring break, Christmas holidays and the summer break. In 1945, near the end of World War II, when some Japanese Americans were being released from camps, California State Sen. George Hatfield from Modesto introduced a resolution that stated that the Japanese Americans were not welcome to return to California. 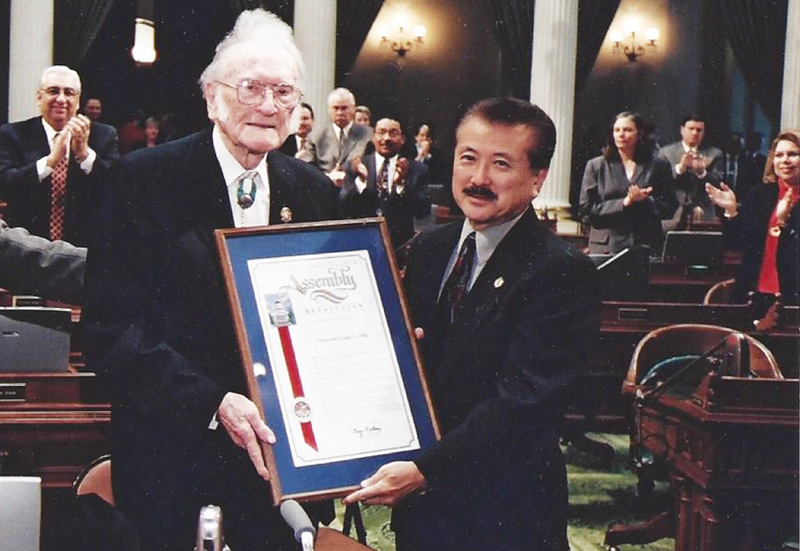 It was then, that Sen. Shelley decided to bring several wounded Nisei World War II soldiers, some without limbs, from DeWitt General Hospital and introduced them inside the Senate Chambers, where the resolution was being heard. He explained that these were American soldiers who had defended our country with tremendous sacrifice and accomplishments. At that point, the entire membership of the Senate rose and gave a standing ovation. The resolution died and never resurfaced. Assemblymember George Nakano presented a commendation to the late State Sen. John Shelley, represented by his son, Assemblymember Kevin Shelley, in 2001. On Feb. 20, 2001, during a Day of Remembrance observance, I had the honor to recognize Sens. Dills and Shelley. Dills had already termed out of office and had to be picked up by the sergeant of arms at Dills’ ranch. When Dills was brought into the rear of the Assembly Chambers, the sergeant came up to tell me that the senator had momentarily forgotten why he was picked up and asked me to please let the senator know why he was here. As I walked to the rear of the chamber, the senator had his hand resting on top of the railing. I put my hand on top of his hand and said, “Senator, we brought you here so we could honor and recognize you for the stand you took against Executive Order 9066 in 1942.” Then I saw tears in his eyes — he understood. Sadly, Sen. Dills passed away the following year. At the same Day of Remembrance program, Assemblymember Kevin Shelley, the majority leader, was there to receive an Assembly resolution on behalf of his father. John Shelley had passed away in 1974, the same year another icon from San Francisco, attorney Wayne Collins, passed away. Kevin’s mother, the wife of John Shelley, was present in the chamber but wanted to stay in the gallery during the ceremonies. Indeed, these two men stood up when no one else would. Both Ralph Dills and John Shelley were men with courage. Both had long careers in public office. Dills went on to serve in the Senate for many years and John Shelley went on to serve in Congress and eventually as mayor of San Francisco. We shall never forget their strong sense of justice and unyielding fortitude. George Nakano served on the Torrance City Council for 15 years and in the California State Assembly for six years (1998-2004).